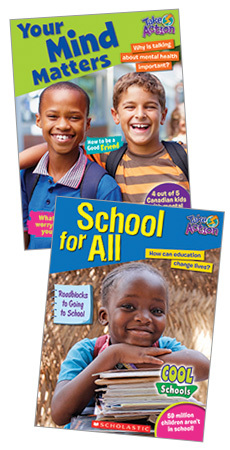 Each topic pack in Take Action includes a 32-page magazine-style book for students, anchor videos, and Teacher's Guide, and is designed for whole-class study with students working in small groups. Teaching support for each selection in the book has the same elements, so you can help students understand and go deeper into the topic. Minds on Reflection (Before Reading): Questions that allow students to reflect on their own background knowledge. Interdisciplinary Connections: Each selection has interdisciplinary suggestions and questions to extend conceptual learning and understanding. Links to Inquiry Question: Prompts to help students reflect on the inquiry question and revise their thinking. Taking Action: This section provides information about individuals, groups, or organizations taking action and questions about the different issues. Think About It! : Contains additional facts or questions for the reader to explore. Further Inquiry: This section examines concepts/themes within the selections and suggests possible topics for further inquiry. The Best Buy – Who really pays when we buy? Every Drop Counts – Why should we care about water? School for All – How can education change lives? The Media Effect – Why should you question the media? Activist Art – How do we use art to make the world a better place? Community Cares – How can we build strong communities? Lead the Way – How can you be a good leader? In Our Hands – How can we be active global citizens? Earth Action – How can we make better choices to help the Earth? Are You Hungry? – What will it take to feed the world? Your Mind Matters – Why is talking about mental health important? Animal Relations – What is our responsibility to animals? 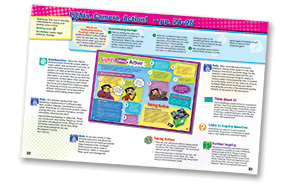 Each Take Action Classroom Topic Pack includes 16 copies of 1 title, a Teacher's Guide, storage box.